Friday, April 19, Martha and I made the long trip from Ocala, Florida toward Winona, Mississippi. Well, we tuckered out barely into Mississippi. We stayed the night in Starkville. Saturday, we arrived in Winona at the World Evangelism Building for breakfast with Jerry and Paula Bates and Shane and Emily Fisher. The Fishers recently moved to Winona, almost simultaneously as Martha and I moved to Florida. After eating, we loaded my utility trailer with about a ton of literature, nearly all of which is “reclaimed” from various stateside congregations. Sunday, Martha and I assembled with the Old Union Church of Christ. During Bible class, I showed my PowerPoint presentation “2019 Guyana” mission trip. We always derived encouragement and assistance from these good brethren in all that we try to do for our Lord Jesus Christ. Later, we drove to Rebecca’s home in Collierville, Tennessee and lodged with her overnight. Monday, Rebecca trailed us in her car as Martha and I drove to Nashville with the trailer in tow. Our daughter is a true blessing to us and goes out of her way to assist us in so many areas. 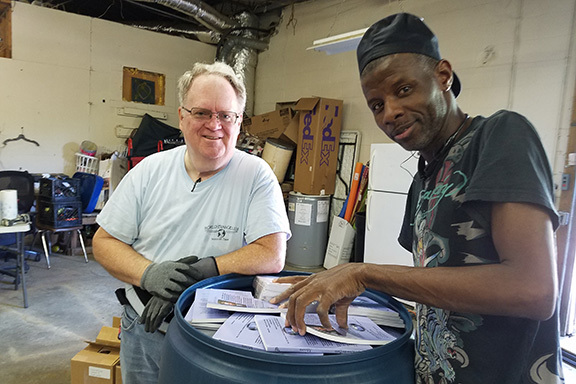 It took us several hours in the warehouse of Caribbean Shipping to pack five jumbo plastic barrels with songbooks, Bibles, maps, communion ware, tracts, The Voice of Truth International and religious books. These items will arrive in June in Guyana, South America, where they will be distributed to most of the congregations of the Lord’s church in that country. Upon returning to Dickson, Tennessee, where we left Rebecca’s car and from which we carpooled to Nashville, we enjoyed a satisfying meal at Cracker Barrel. Happily, brother Roger and sister Mary Wright called us and suggested that we dine together. They and we arrived in Dickson about the same time. On the way into the restaurant, I spied a prank, hanging out from under a car’s trunk lid. Afterward, we checked into our hotel, where we will spend the next three nights. While I was checking in, Martha decided to unload luggage from the back of the van. However, she tripped over the trailer hitch; we had already detached and parked the trailer behind the hotel. She hurt her elbows and tore up skin on one leg and her arms. Tomorrow and Wednesday, Lord willing, we and others intend to attend the 2019 Annual India Mission Conference. This year, it is being hosted by the congregation in Burns, Tennessee. Thursday, we will return to Rebecca’s home. Friday, we will load the balance of our belongings in Winona. Sunday, we expect to assemble with two churches of Christ in the vicinity of Jackson, Mississippi. Monday, we plan to head toward Hamilton, Alabama for the yearly Maywood Missionary Retreat. Wednesday night, I have an appointment in Leighton, Alabama. Saturday, we head for Piedmont, Alabama. Sunday we are to assemble with two churches of Christ for me to acquaint them with our mission work. Monday, we head back to Ocala, Florida for a couple of weeks before heading out again for a week or two. That’s about 18 days on the road, this time with the next trek already in view. In September, if our Lord wills, we head back to Asia for a few weeks. We covet your prayers. Martha and I are thankful especially to brethren and congregations that make it possible for us work for the Lord stateside and abroad.